Fusion, ARM and x86: what's Nvidia's next move? AMD has Fusion, but what does Nvdia have? With AMD tooling up to give the market a second masterclass in DX11 graphics, the spotlight will soon turn on Nvidia, its main rival in the graphics business. Nvidia has a few things up its sleeves in terms of new graphics chips. But even if the mooted update to the troubled Fermi graphics architecture is successful, that won't secure Nvidia's future. The problem for Nvidia can be summed up in a single word. That word is fusion. Both AMD and Intel are committed to fusing most, and eventually probably all, of their PC processors with graphics chips. A single chip will handle all the computationally intensive work inside future PCs. Nvidia, of course, doesn't make PC processors. It only makes the graphics half of the fusion equation. More to the point, it lacks the licences required to produce a PC processor. At least, it lacks the all-important x86 licences required to make processors compatible with AMD and Intel's x86 chips. Processors that will run software like the desktop Windows operating systems natively. Nvidia itself has more or less admitted it will eventually have to face up to fusion. In early 2009, senior Nvidia suit Michael Hara told investors that it was more a case of when than if Nvidia would want to get into the general purpose processor business. "I think some time down the road it makes sense to take the same level of integration that we've done with [the ARM-based] Tegra...someday it's going to make sense to take the same approach in the x86 market as well," Hara said. Of course, the problem with that analogy is that British-based ARM is very much in the business of licensing out entire processor architectures to third parties. It doesn't make any chips itself. Historically, however, Intel and AMD have done precisely the opposite, manufacturing everything in-house. Recently, AMD has shifted to a slightly different model, spinning off its manufacturing arm into a separate company. But arguably, even that caused ructions regarding its licenses to produce x86 chips. Flogging designs off to a third-party like Nvidia would be even more problematical. What, then, can Nvidia possibly do? In terms of directly licensing an x86 processor design, there really only seems to be one option, Intel. 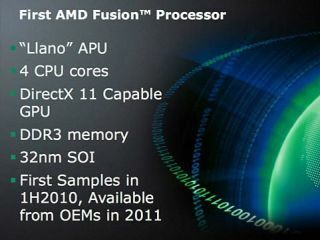 The good news is that Intel is indeed looking to get its Atom processor core into as wide a range of chips as possible. That includes for the first time farming out production to Taiwanese chip fab TSMC. Intel realises that custom chips are often needed for mobile devices like smartphones. The best way to serve that need is to allow third parties to cook up solutions based around Atom but including IP from other companies. In theory, that could include Nvidia. The catch is that relations between Nvidia and Intel are not exactly amourous. In fact, you could say that the very last company Intel would licence out Atom cores to would be Nvidia. At best, therefore, Nvidia would be a bit player providing graphics IP for someone else to knock out an Atom-based chip. There is, however, one last hope for an Nvidia x86-based fusion processor. Rightly or wrongly, America's Federal Trade Commission appears to have its sights set on Intel. Having already forced Intel to pay AMD one billion dollars for behaviour relating to CPUs, the FTC is now saying Intel is engaged in anti-competitive behaviour in the graphics. To cut a long story short, it's just possible legislators and regulators in the US will force Intel to give Nvidia an x86 licence. If that doesn't happen, there is one possibility left, although very remote. Theoretically, Nvidia could produce a chip that implements some kind of translation technology to run x86 code non-natively. This approach isn't without precedent. A small startup known as Transmeta had a stab at this in the early to mid '00s with its "code morphing" Crusoe processors. The business failed. But its chips did work well enough to provide proof of concept. Rumours involving an ARM-based Nvidia chip with x86 codemorphing have indeed been circulated. Given that power efficiency is increasingly crucial, however, a non-native x86 processor and all the overheads that come with it seems rather implausible. But perhaps even more telling are recent comments made by Nvidia's head honcho Jen-Hsun Huang. "ARM will be the most important CPU architecture of the future and it already is the fastest growing processor architecture," Huang said in September. In fact, Huang claims ARM will replace x86 as the dominant processor architecture in PCs. It is indeed probable that Intel will face increasing competition from ARM-based architectures, even in its core PC market. Mobile devices are rapidly taking over the computing ecosystem and ARM rules mobile. ARM might even eventually come out on top. But that battle has only just begun. What's more, Nvidia's own ARM-based Tegra chip has so been a bit of a flop. So, even if ARM wins, Nvidia may still lose. However you slice it, in other words, Nvidia will need to up its game.